In her latest exhibit, famed artist Fujiko Nakaya’s asks, how can we collaborate with nature? Her ongoing cooperation with natural elements has spanned decades and created temporary fog landscapes all over the world. 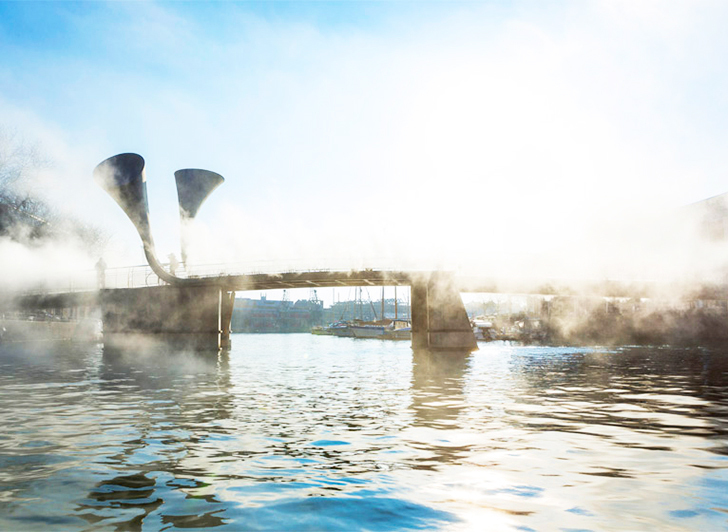 In Bristol this February, the Japanese Artist has shrouded Pero’s footbridge in billowing fog clouds, immersing passersby in a bewildering white mist. Thanks to photographer Max McClure you can get a feel for what it’s like amongst the clouds even if you can't be there. 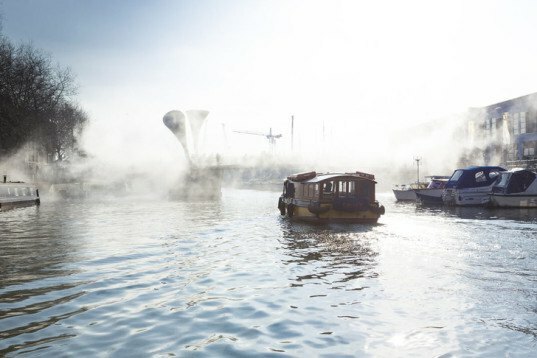 A fog ‘performance’ takes place every 15 minutes during Bristol’s ‘In Between Time’ Festival. Nozzles suspended around the bridge at foot level create a stormy mist which is whipped up by the breeze to envelope pedestrians. The experience has put smiles on the faces of visitors, happy to be disorientated in a white blanket-like covering of fog and navigate the bridge by intuition. Nakaya has brought fog interventions to Swiss lakes, Frank Gehry’s Guggenheim Museum and Philip Johnson’s famous Glass House, but this is her first UK commission. Celebrating Bristol’s status as European Green Capital, the mutating cloud of fog aims to invite visitors to consider the changing climate. Pero’s Bridge was designed by Irish artist Eilis O’Connell and built in 1999. Trumpet style sculptures on the bridge make it a landmark of Bristol’s Harbourside. The structure takes it’s name from Pero Jones, an enslaved African who was brought to Bristol by a wealthy merchant in 1784. You can experience the artwork yourself if you are in the Bristol area before the end of Sunday 23rd February, but for more of a feel you can check out some video footage and hear more about the concept and how visitors have reacted here. A fog ‘performance’ takes place every 15 minutes during Bristol’s ‘In Between Time’ Festival. Nozzles suspended around the bridge at foot level create a stormy mist which is whipped up by the breeze to envelope pedestrians. The experience has put smiles on the faces of visitors, happy to be disorientated in a white blanket-like covering of fog and navigate the bridge by intuition. The structure takes it’s name from Pero Jones, an enslaved African who was brought to Bristol by a wealthy merchant in 1784. Pero's Bridge was designed by Irish artist Eilis O'Connell and built in 1999. Trumpet style sculptures on the bridge make it a landmark of Bristol’s Harbourside. Celebrating Bristol's status as European Green Capital, the mutating cloud of fog aims to invite visitors to consider the changing climate. Nakaya has brought fog interventions to Swiss lakes, Frank Gehry's Guggenheim Museum and Philip Johnson’s famous Glass House, but this is her first UK commission.